The Cape On Bowen is a very rare oceanfront property. Its beaches, trails, shorelines, and dense woods have been virtually untouched for more than 50 years. Best of all, it is only 20 minutes’ sail from Vancouver. Here, a limited number of waterfront island estate properties are available for the first time. These 10-acre home sites are exceptionally private, and enjoy transcendent views of the ocean and neighbouring islands. 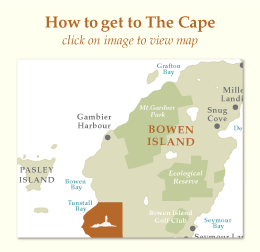 The Cape On Bowen is a rare chance to own an enviable island estate. There is truly nothing like it.